Research in Nursing Series The main objectives of this study were to present profiles of a hostel in Glasgow and a comparative hostel, to make assessments and referrals and to evaluate their effect. These objectives were successfully met along with secondary objectives to discover insights into the residents' experiences and lifestyles, and their interaction with health and nursing services. The objectives were addressed by gathering and analysing quantitative and qualitative data and the use of theoretical perspectives: Roy's nursing theory of adaptation (to study the men as individuals) and a sociological perspective, including Deviance Theory, to examine the men as a group. Although the study concentrated on District Nursing practise, it demonstrates universal methods of nursing practise relevant to all community nurses. 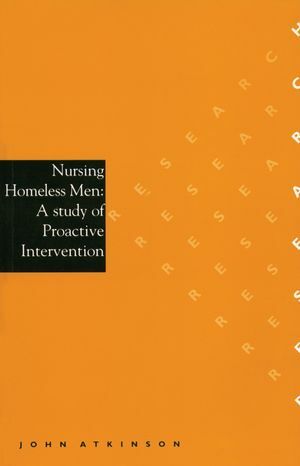 John Atkinson is the author of Nursing Homeless Men: A Study of Proactive Intervention, published by Wiley. Research Design, Method and Pilot Study. Results: Evaluation of the Health Professionals. Evaluation: The Expert Panel and Expert Witness. Analysis: The Men as Individuals. Analysis: The Residents as a Group. Appendix I - Fieldwork Pack. Appendix II - Sample Letters.